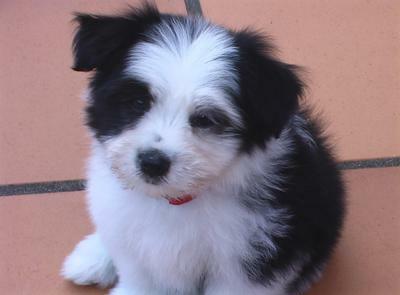 Luca's mother is a pure-bred Maltese and the father a pure-bred Border Collie. 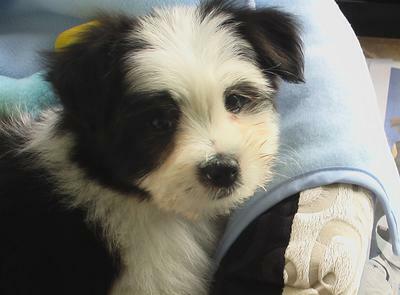 I looked on this site and saw Trapper who is a similar mix but he looks nothing like Luca! He craves company so is more lap dog than sheep rustler although he does like to try and round up birds or, failing that, tennis balls. Luca adopts the traditional Border Collie crouch when he attempts the task but he's so small he usually contents himself chasing flies. He's good at it too! Luca is unquestionably intelligent and even helped me save a pet guinea pig when he alerted me to its squeaking in the middle of the night. A python had got into the hutch and was about to crush the guinea pig. It was so dark I couldn't see the snake so just shoved my hand in and pulled the monster out. Luca thought it was great fun and he proceeded to try and play with the shell-shocked guinea pig who landed on the grass!